Nevada is a pretty interesting place, and we've only just driven through it most of the time. We wanted to do a trip dedicated just to driving around and exploring Nevada, where the state itself was the main attraction. So we decided that spring break would be the perfect opportunity to go see the desert and all it has to offer, since it would still be cool outside, but late enough in the season where snow on the mountain passes shouldn't be an issue. We wanted to take the bus so we could have the luxury of camping in comfort and still have a lot of mobility. 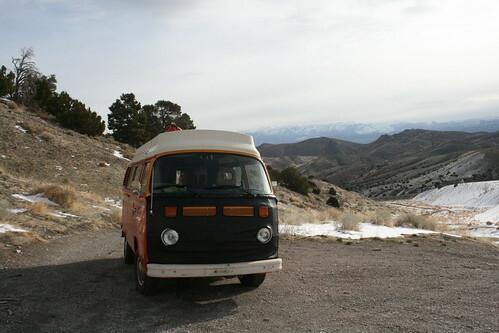 We camped near the 1954 earthquake fault in central Nevada. We have a hot spring guide book (two actually) that give information on the natural hot springs in the state of Nevada. 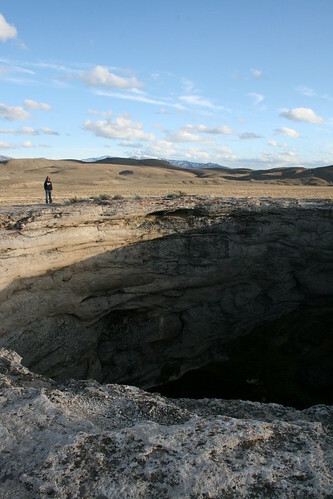 Because of it's geology, it has the most hot springs of any other state in the U.S. So far, over winter break (just about 2 months ago), was the first time we've ever ventured out to a hot spring in Nevada, although we've heard a lot about them. For this trip, one of our goals was to find as many as were possible in the short 1-week long break we had. With so many to chose from, where did we begin? Well, the easiest way for us to get over the Sierra Nevada mountains in the bus was to drive over Hwy 50, through South Lake Tahoe. From there, we continued on Hwy 50 out east into Nevada. This took us nearly all day, so we just barely got past Fallon, NV when it was time to camp for the night. We saw a brown sign (BLM) pointing us to a place called "Earthquake Fault." It was so dark we had no idea where we were going, but the sign said it was 6 miles away. So we drove down the road until we found a level spot and camped right there. The next morning, we continued to the fault line. It was actually really huge, but not what you would expect an earthquake fault to look like. There was no gaping crack in the ground. Instead, it was a steep step in the mountainside, and at parts the cliff, or scarp was about 20 feet tall! That's how much the earth shifted during the earthquake, which happened in 1954, and was of magnitude 7.2! Valley of the Moon Hot Spring was hot hot hot! After exploring the fault scarp a bit, we continued east, back on Hwy 50. We passed through Austin to get some yummy cappuccinos at the Toiyabe Cafe, and then headed north up the Valley of the Moon, along NV 305. This was a really nice drive, and about half-way to Battle Mountain (which is on I-80), we stopped at a hot spring called Valley of the Moon. It is privately owned, but the rancher who owns it lets people come on his land and use the hot spring. However, you kind of need to know where it is ahead of time because there is no sign, only a gate which must be closed behind you to keep the cattle in place. We knew we were getting close when we started seeing the tell-tale signs, a big travertine mound and white soil. When we pulled in, nobody was there. The source of the hot spring was about 50-100 feet away from the pool, and it came pouring out of the mound along a giant crack in it. Near the pool, a pipe diverted most of the hot water into the rock bottom pool. The source was super hot, basically unbathable unless it was allowed to cool off. The people before us left the pipe fully flowing into the pool, which made the water unbearable when we got in, so we had to wait. We pulled the pipe out and let the water cool. This took quite a while (almost 2hrs) but we just pulled out our folding chairs and relaxed a while, reading all of the historic pamphlets we got from Austin at the Toiyabe Cafe. 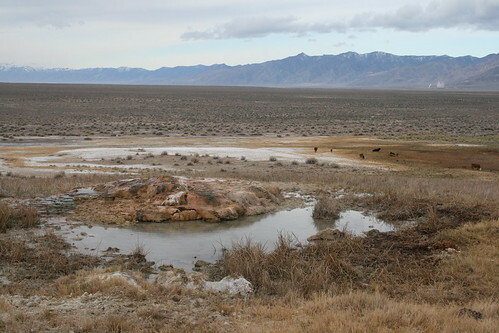 The Buffalo Valley Hot Springs were small, but plentiful. When we compared the state of the pool area to that of the picture in the guide book, the spring in its current condition was pretty trashed. Previously, somebody had placed a nice wooden bench at the side of the pool, and it looked like there used to be wooden platform mini decks all around the pool. Now what we saw was a partially burned bench, no decks, and two fire pits filled with empty booze bottles. We cleaned up as much as we could, but it is really horrible how people end up trashing such a nice place. Why? Why would you try and burn a picnic bench just to stay warm or make a fire when you have a super hot pool to bathe in? And why wouldn't you just take your trash out with you? Anyways, after soaking in the pool for a little while after it finally cooled down to the point that it wasn't painful, we hopped back into the bus and continued north to Battle Mountain. At the city we filled up on gas. A few young and bored tweens saw us in our bus, and asked us if we had weed. Hahaha! I kind of felt sorry for them, all bored and growing up in a place like Battle Mountain, where the only thing to do is ride your bike from the McDonald's to the Burger King or whatever. During our little driving break at Battle Mountain, we looked at the map to see the nearest hot springs. There were a few on the map which weren't in the guide book, so we decided to check them out. This time, however, they were very far off the beaten path, a long ways down a gravel road where there were few if no people, and we would be very isolated. But the bus was running well, so we decided to go for it. Hyder Hot Springs was so hot, we found a dead cow as we drove right past this sign! The gravel road we took had no name, except that it went into a large valley called Buffalo Valley, and then continued into Dixie Valley. A bunch of powerlines ran down the east side of the valley, which the road followed for a long time. In the center was a long playa. After almost an hour of driving, we reached the approximate location of where the hot springs were marked on the map. 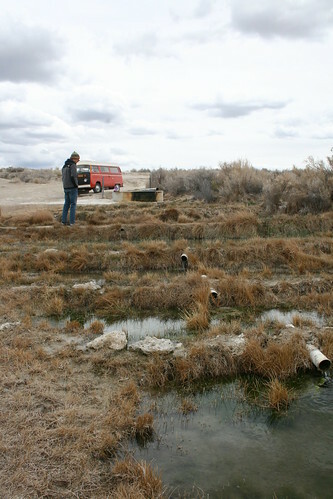 They were called the Buffalo Valley Hot Springs, and as we got closer, the springs became very obvious. We parked the bus as close as we could and followed cattle trails out into the playa where there were numerous mini craters with warm water flowing out. None were very big, but there were a lot of them. They weren't very hot either, and the flow rate was very low, so you couldn't really make use of them for soaking. Oh well, it was neat to find them still in their natural state. After we explored the area a little, we continued driving down the gravel road south. 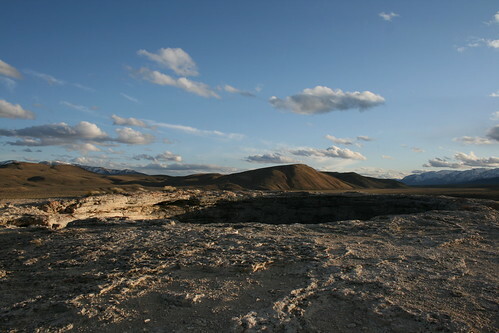 Soon we entered the Dixie Valley region, which was the valley where Nevada's largest geothermal power plant is located. Again, this place was very isolated, but it was also the region where the most hot springs are supposedly located in the state. 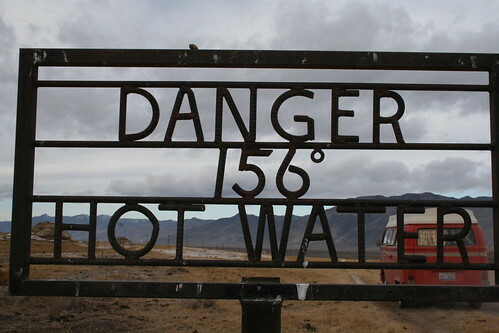 As we drove down the gravel road, we saw a few hot pools, some not marked on the map. One of the pools was very deep (you couldn't see the bottom) and it was pretty hot. Very tempting to jump in but the fact that you couldn't see the bottom scared us, so we only took pictures. There were some hot springs we passed owned by ranchers, which they made very clear with huge private property signs. At one point, we had to skirt around some ranch land that they didn't want people driving through, and the detour road got really muddy and rough. Somehow the bus got through it, so we continued on. 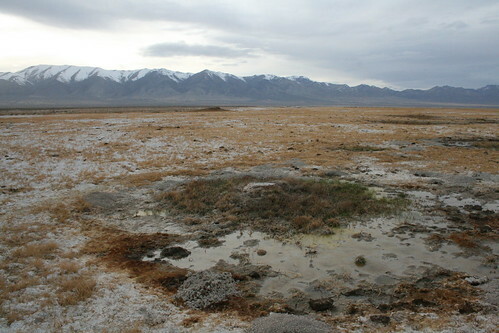 The next big hot spring that was in this valley which the guide book recommended was called Hayden Hot Springs. It took us quite a while to get to it, and by the time we did it was already dark. So we found a flat area next to the springs and camped for the night. The next morning, we woke up to find a huge water buffalo truck parked next to the springs, but nobody was with the truck. It was just parked there. We also saw a dead cow right next to the spring. The source was pretty obvious and surrounded by a fence. There were supposedly two bathing pools here, but when we found them, they were really nasty and shallow! They were all slimey and the water was just luke warm. It also seemed that when we compared the picture of the source in the guide book to what it currently looked like, it seemed that the current flow rate and temperature were much lower than when the book was last published. Maybe it had to do something with the geothermal power plant off in the distance. Who knows, but Hyder Hot Springs seemed like a bust! 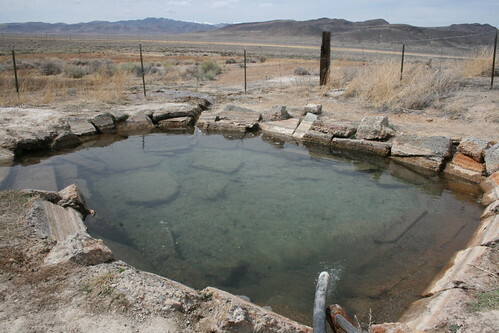 The once vigorously flowing Hyder Hot Spring source. We didn't stay at Hyder long, and instead we picked another gravel road to take over a small mountain pass to the southeast. The road was in very good condition, even though it looked like it was a minor gravel road on the map. It went up and over the mountains, through a canyon like landscape. It passed an abandoned ranch, which was so cool looking, and then popped out just north of Austin. So essentially, we just did a giant loop, up through the Valley of the Moon on a paved road, and then down through the Buffalo and Dixie valleys all of gravel. When we passed through Austin (again) we gassed up. This time I wanted to try a different cafe for coffee. We saw in our pamphlets that the International Cafe was supposedly very old and still had the original bar interior from the old Pony Express days. We seemed to be the only out-of-towners there, which was okay, and it made it interesting to hear the locals talking. The cafe only served drip coffee with creamer, and it was pretty cheap. I was hoping for some espresso, like in the comparatively hole-in-the-wall Toiyabe Cafe up the street. Oh well, now I know. I am a picky coffee person, and having said that, if you want coffee, go to the Toiyabe Cafe. Anyways, after our big loop detour, we started heading east again. We wanted to check out the Big Smokey Valley and the neighboring Monitor Valley. These are right in the heart of central Nevada, and of course they have some really cool looking hot springs, as we saw in the guide book. So we started heading that way. But the weather was getting kind of crappy, with rain headed our way, and snow dumping over the passes! We got as far as Spencer Hot Springs, and decided to wait out the weather there for a while. After Spencer, we had to take a gravel road over a mountain pass to get into Monitor Valley. We didn't want to start driving over the mountains if there was snow coming that way, so we just relaxed at Spencer, where we had a good view of the incoming weather. The beautifully terraced pools at Spencer Hot Springs. Nothing much happened weather wise while we were hanging out at Spencer. It kept raining and snowing to the west, but it never seemed to get across the valley, which was good. After about two hours, the weather actually started clearing out, and we decided to go for it. While we were waiting, we found out that somebody had terraced one of the pools at Spencer, and the run-off from the pool cascaded down the terraces. Within the pools of the terraces, we found a bunch of goldfish! They were just swimming happily, and there was a pretty large and healthy population. How cool! After the weather began to improve, we got back into the bus and started up the gravel road over the mountains. This route was actually recommended as one of the scenic drive in the Big Smokey Valley pamphlet we picked up in Austin, so the road was probably good. Along the way, it went past the Toquima Caves near the summit. Then it dropped back down into Monitor Valley. Once there, we used the guide book to find the next closest hot spring, which was called Pott's Ranch Hot Springs. We drove south down the Monitor Valley, which was amazing! There were more ranches, it seemed, in this valley, because it seemed that water was more plentiful here. The guide book warned that along the road, you would have to drive through an operating ranch. When we got to the ranch, we saw a Mexican guy sitting on the roof of one of the many barns. We asked him if this was the right way and if it was okay to drive through, and he just looked at us and smiled. We realized after a while he didn't speak English, so we just said "Bueno", and kept driving. Eventually we got to the turn off to Pott's Ranch, which in contrast, is totally abandoned. Living life to the fullest at Pott's Ranch Hot Springs. There was a huge mound that we had to drive around, and the hot spring was located out of sight of the road, on the other side. When we got there, we discovered a completely brand new tub and lovely deck and seating area. The tub was kept empty, as to keep it clear of algae and other stuff. The hot spring source had an incredible flow rate, so once we set up the proper piping to fill up the tub (8 foot diameter watering trough), it was full in about 15 minutes. And the water temp coming right out of the pipes was perfect, so no temperature adjustment was necessary. 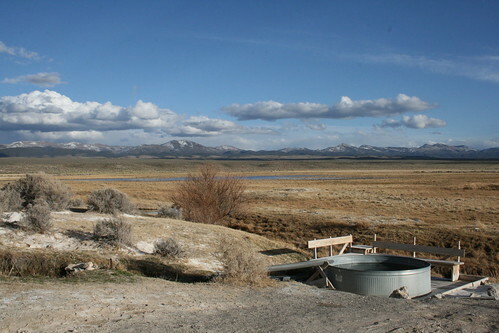 The tub here had a great view of the surround mountains and valley. Our favorite hot spring we've been to so far is Pott's Ranch. We stayed at Pott's for quite a while because it was so comfortable. The guide book that we had said that the owner did not allow camping, however. So we decided to leave with enough time to still find a campsite. Again we looked at the guide book to see where we should go next. Just south of where we were, it said that we could go see Diana'a Punch Bowl. We read about this place in other books, and all of them said that the Punch Bowl was a pretty awesome place. Supposedly, it was a huge caldron looking thing with steamy hot water inside. I had no idea how big it was going to be, but it was supposed to be really big. We decided that it would be the best place to camp nearby, since there were no camping restrictions. So off we went. 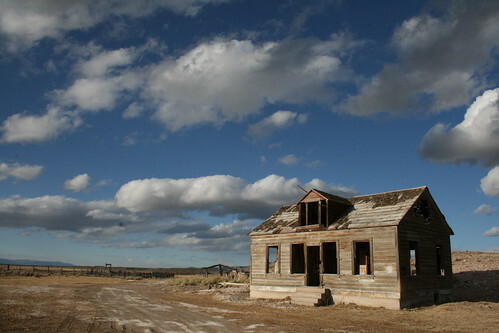 The abandoned farm house at Pott's Ranch. It was pretty easy to spot Diana's Punch Bowl once we were nearing it. It was a huge whitish travertine mound in the middle of the valley, just east of the gravel road. When we got near, we followed one of the few smaller dirt roads that headed towards the mound. When we finally reached it, there was a fence around the whole thing, but it was only to keep animals out, as it was easily opened. We decided to drive through the fence gate, and then parked the bus just at the base of the huge mound. 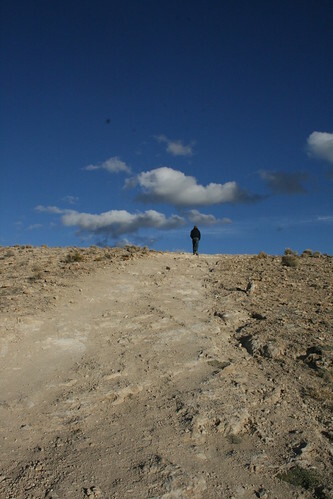 Romy started walking up the pathway that led to the top. It was huge and it was steep! As you climbed up it, it was impossible to see what was on the top until you crested it. . . Climbing up the gigantic travertine mound that is Diana's Punch Bowl. When we got to the top, the ground just dropped out into a HUGE cauldron! Just like something out of Lord of the Rings (without the hot lava), at the bottom was a pool of steaming hot water. It was impossible to tell how deep it was, but judging from how large the mound was, it must of been pretty deep. The edge was very abrupt, so if you weren't paying attention, it would be relatively easy to just walk off and plunge into the burning hot water. We sat on the edge with our feet dangling down. It was surreal. The insanely awesome Diana's Punch Bowl! It was fun just hanging out and seeing such a unique place in the middle of a beautiful desert landscape. We walked around the cauldron a few times. Supposedly it was formed when the thing suddenly caved in, leaving an almost perfectly circular caldera thing that filled with the hot spring water that presumably caused it to collapse. Next, we checked out the backside of the base of the mound, where there was supposed to be a hot creek running out of the punch bowl. The guide book said you can dig mini pools and bathe in the water coming out of the mound-bottom, but we didn't find any suitable places. That was okay though, because it was starting to get dark, and we were thinking of going a little further south in the valley to camp. Diana's Punch Bowl was our last hot spring of the trip through Nevada, and it certainly was one of the most spectacular springs we've ever seen! Don't fall into the punch! Excellent report! I'm planning a trip to visit the hot springs of Washington and Oregon this summer. I see at least one is recommended off-limits because of high e-coli count due to over use...sad. Just love Potts Hot Spring. Takes a real Hot Spring lover to make the trip, but it is well worth the water and view. Potts is on private property and is now closed to the public. Do you mind sharing the book you are referring to? I am about to make a very similar trip and I really enjoy a great informative book. Thanks!